More importantly, despite its fragile status, the state, the Yemeni republic of the people has been the greatest unworthy victim by Houthis attempted coup d'etat against president, Hadi in September, last year. Houthis have been cracking down on its dissidence, which includes Hadi himself, ever since their expansion from Sa’adah to Sana’a in July last year. Specifically, since September, 2014, there have been dozens, if not hundreds, of civic activists, journalists, human rights defenders across Yemen who got harassed, abducted and tortured - some to death - by the Houthi militias in their own bloody purge. 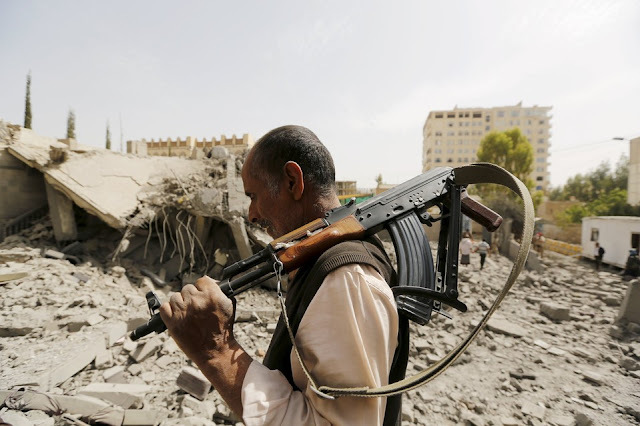 Without giving any justification to the Saudi-led airstrikes campaign, which was initiated with the blessing of Yemen’s president Hadi himself, the airstrikes came as a reaction to Houthis’ already existing violence. On the 26th of March, the Saudi-led coalition, consisted of 11 Arab countries decided to bomb Yemen, while the other 11 Arab countries stood and watched in silence. The coalition’s aim was to restore president Hadi’s legitimacy, viewing Hadi as its only worthy victim and who deserved to remain safe in the palm of comfort in Riyadh in KSA. Are the strikes effective way to solve problems? of course not and more importantly they have led to a situation that is nothing but disastrous. As the Saudi-led coalition keep on claiming firing its airstrikes only against military points, the strikes’ horrifying collateral damage say one thing that Yemeni citizens are unworthy victims of these strikes, in the name of restoring a president’s legitimacy. For those who escaped the violence and became refugees at the shores of Somalia, Djibouti and elsewhere, they have been treated as unworthy victims in so many levels. Dozens of accounts by Yemeni refugees show how they were ill-treated and disrespected. Young Yemeni men are piling up at the gates of the Saudi borders facing extreme and random conditions to allow them entry. A relative I have was sent back to Yemen after she miraculously managed to escape to Sudan. Another relative I have was stuck in a refugee camp in Sudan for days while being mistreated, witnessing loads of violations against the human rights of these refugees. Miraculously, my relative made it to Ethiopia. For all Yemenis fleeing the violence, what the future holds for them is totally uncertain. It must be clear though, for a country to shut its doors against humans escaping death is another form of violence. All these victims’ sufferings represent an unprecedented humanitarian catastrophe. In Yemen, millions are facing the threat of famine because food assistance is not reaching them. People on the ground have been reporting how Houthi/Saleh forces in Aden are using food and medicine as a weapon of war, ‘I watched them turning back truck loads of flour trying to enter the city,’ describes journalist, Iona Craig. Even worse, while more than 15 million are in need of basic health care, countless wounded are dying because hospitals are closing down due to lack of fuel. As a result of the total disruption by the war of all basic services an estimated 20.4 million people in Yemen are in need of potable water. Diarrhea’s prevalence – as well as risks of cholera, malaria and worm infestations – have all skyrocketed. The World Health Organisation said last month that more than 3,000 Dengue cases have been reported in Yemen since March, adding that the actual figure could be far higher. While the suffering of Yemenis continue, there has been a humble global solidarity action that is trying to challenge the Saudi hegemony of media narrative about the situation in Yemen. Even though the momentum is not huge, it is the only matter that makes Yemenis still believe in our shared sense of humanity. Nonetheless, I urge everyone showing sympathy to Yemenis suffering to not only condemn the atrocities committed by the Saudi-led coalition but also to condemn the atrocities committed by the Saleh and Houthis’ forces. Don’t prioritise atrocities coming from one side over the other; violence exhibited from all sides should be condemned. For those who are in solidarity with the people in Yemen, make it clear that all victims in Yemen are worthy of peace and stability. Yemen appreciates all the global solidarity actions but what Yemen is desperately in need of is the action of those in the international community with influence on the parties in the conflicts. Since the beginning of the war, the international community’s silence has been the loudest sound Yemenis hear. 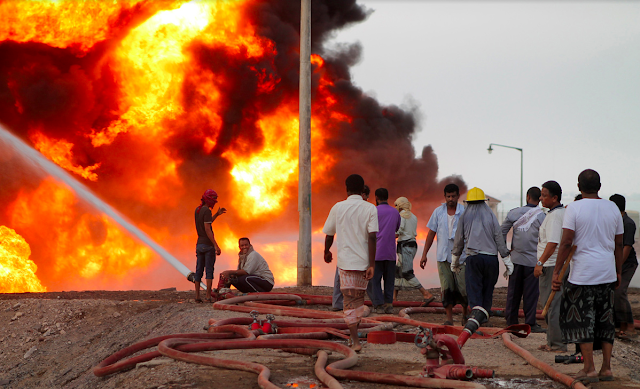 It’s time to break the silence about the violence in Yemen affecting all sides’ victims. In the meantime, all parties allowing Yemen's humanitarian catastrophe to deepen longer are committing inhuman acts that may reach crimes against humanity.